The service will expand to include all of Snoqualmie valley and Monroe. Door-to-door bus service has expanded in the Snoqualmie Valley, covering the valley communities from North Bend to Snoqualmie, Fall City, Preston, Carnation, Duvall and now, the city of Monroe. Residents throughout the Snoqualmie Valley can get to and from their auto repair shops, medical appointments, farmers markets, food banks and other destinations on a Snoqualmie Valley Transportation (SVT) bus. SVT’s shared ride service has been serving the Valley for 15 years and is open to all riders, age 13 or older. The service operates weekdays, from 6 a.m. to 8 p.m. in North Bend, Snoqualmie and Fall City, and 8:30 a.m. to 4:30 p.m. in Carnation, Duvall and Monroe. Fares are $1 per person. To schedule a ride with door-to-door service, locals can call 425-888-7001 at least one day in advance of your trip. Locals should be sure to give the date, time and complete addresses for your pickup and drop-off locations and to specify if you need assistance in boarding the bus. With three to five days’ notice, schedulers are better able to consolidate routes within the communities. Same-day ride requests will be accommodated on a space-available basis. Once a ride is scheduled, SVT will confirm the appointment by phone. Riders should plan to be at their pickup location about 15 minutes ahead of schedule, as the schedule can vary slightly. If locals would like to get an estimated time of arrival, they can call SVT at 425-888-7001 about 20 minutes before your ride is scheduled, to find out how close the bus is to you. All buses are marked with “SVT” on the front, and all buses are equipped with wheelchair lifts and bike racks. Drivers will typically pick up several riders before delivering them to their respective destinations, so trips may take longer than you expect. Schedulers do work to keep rides direct, while also keeping the service cost-effective. To cancel a ride, riders can call SVT at least an hour in advance of the scheduled ride. The Preston service excludes the Mitchell Hill area. SVT also provides the Valley Shuttle service, getting people to their destinations throughout the Valley between North Bend to Duvall, and fixed-route loops between Snoqualmie and North Bend and a loop between North Bend and Rattlesnake Lake. Some riders may be referred to these routes, depending on their needs. For more information, visit www.svtbus.org, or call 425-888-7001. 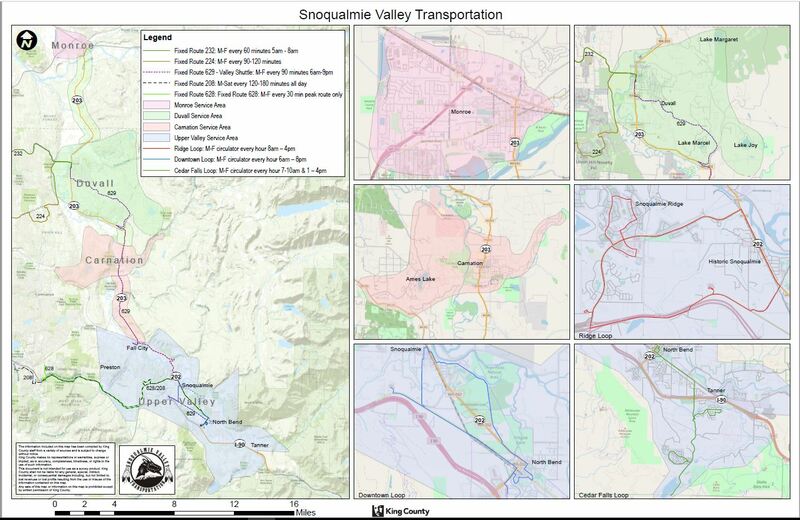 Snoqualmie Valley Transportation (SVT) is a project of Mt. Si Senior Center. SVT began its services in 2003 with funding assistance from Snoqualmie Indian Tribe, King County Metro Transit, and the Washington State Department of Transportation. To download a map of the demand-response service areas, locals can go to http://svtbus.org/wp-content/uploads/2018/01/SVT-SERVICE-AREA-2018.jpg. Locals can contact Snoqualmie Valley Transportation at 425-888-7001 for additional information.